In any situation involving more than one person, conflict can arise. The causes of conflict range from philosophical differences and divergent goals to power imbalances. 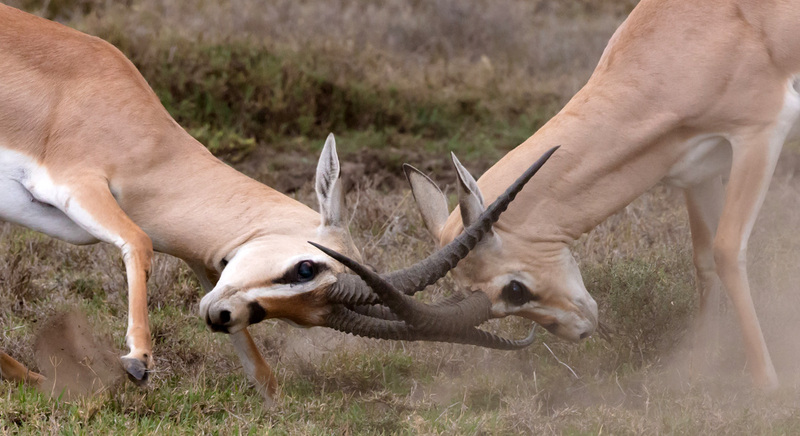 Unmanaged or poorly managed conflicts generate a breakdown in trust and lost productivity. For small businesses, where success often hinges on the cohesion of a few people, loss of trust and productivity can signal the death of the business. With a basic understanding of the five conflict management strategies, small business owners can better deal with conflicts before they escalate beyond repair. The avoidance strategy seeks to put off conflict indefinitely. By delaying or ignoring the conflict, the avoider hopes the problem resolves itself without a confrontation. Those who actively avoid conflict frequently have low esteem or hold a position of low power. In some circumstances, avoiding can serve as a profitable conflict management strategy, such as after the dismissal of a popular but unproductive employee. The hiring of a more productive replacement for the position soothes much of the conflict. The compromising strategy typically calls for both sides of a conflict to give up elements of their position in order to establish an acceptable, if not agreeable, solution. This strategy prevails most often in conflicts where the parties hold approximately equivalent power. Business owners frequently employ compromise during contract negotiations with other businesses when each party stands to lose something valuable, such as a customer or necessary service. Competition operates as a zero-sum game, in which one side wins and other loses. Highly assertive personalities often fall back on competition as a conflict management strategy. The competitive strategy works best in a limited number of conflicts, such as emergency situations. In general, business owners benefit from holding the competitive strategy in reserve for crisis situations and decisions that generate ill-will, such as pay cuts or layoffs. As mentioned in the beginning that conflict arise when there are 2 or more people involved. This involvement can stretch over a veriety of spectrums, for example – Involvement in Projects, Daily operation, strategic descisions, execution etc. Because people are different you can expect them to argue differently and therefor you want to apply the healthiest dose of Conflict managent possible. Personally I do believe in doing your homework before the time, understand who you “customers” are hat will form part of the conflict, then build a combine solution of the factors as mentioned. No “one size fits all” conflict management resolution will suffice in any event, but your approach and awareness of the situation and contributors might bring forth a reasonable solution. Ask the following question before the discussion or yelling starts: What would you like to accomplish with this discussion/argument? During the potentially “heated” discussion balance your argument with fact and question. Remember throwing people with fact will in most cases aggravate the situation, however when asking the right questions it allows the other party to think and potentially realize that their argument is not as good as they set out to believe. Try and maintain eyelevel with the other party – Sit when they sit, stand when they stand. This will alow for mutual mental cognitive respect. Its subconscious realization by both parties that neither has the opportunity to talk “down” on the other party. If I had to ask the question… Who likes conflict, only a small percentage of people will put their and up. However conflict can happen so quickly and before you know it someone is upset or in someone’s face about something. Think about your approach – do you walk in with the facts and throw it into their face backed-up with accusations? What is the best way to bring across your point without being confrontational but yet show how serious you are? Many times I am confronted with having to address unwanted behaviour or poor execution by others, however you want to give the other party the opportunity to realize themselves that they made a mistake and rectify it the best way possible. The aim is for the other parties to take ownership for their contribution to the issue as well as taking accountability towards the solution. Most people explain something as if everyone is an idiot – not sure if you have ever noticed but they explain themselves repeatedly and give as much detail as possible. Do you mind sharing the process of issuing stationary to staff? Are you still happy with the choir list for the kids? Can I pick your brain with something? I would like to keep my car clean for longer, but at the moment I have to take it to the vallay weekly and the cost is getting to high. I have thought of a few ideas to keep it clean, but what do you think I can do? The payroll submissions deadline are exceeded regularly, what do you think is causing it and how do you suggest we correct the behaviour.